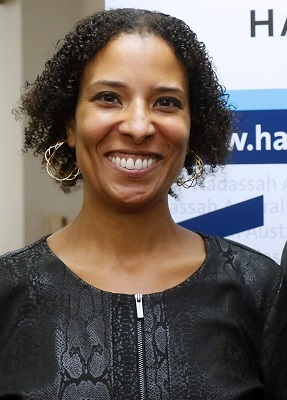 Hadassah Medical Organization obstetrician-gynecologist Mushira Aboo Dia was recently awarded the prestigious Gallanter Prize in recognition of her volunteer work for Physicians for Human Rights. On Saturdays, Dr. Aboo Dia, who serves as chair of the organization, treats women in the West Bank. In addition to working as a senior physician in Hadassah Hospital Ein Kerem’s delivery room, she is an on-call expert in the Bat Ami Sexual Assault Treatment Center at Hadassah and also treats high-risk patients, mostly religious Jewish women, in the Women’s Health Center of the Clalit Health Services in Beit Shemesh. Dr. Aboo Dia grew up in Ramla and lives near Jerusalem in moshav Even Sapir. A recipient of a Wexner Foundation Israel fellowship, she recently completed her Master’s Degree in Public Administration at Harvard’s Kennedy School of Government. The Gallanter Prize is administered by the Sanford and Linda Gallanter Foundation.